​Thetis is a Nereid, a minor sea goddess, in Greek mythology, but Thetis was made famous because of her role as a mother, for Thetis was the mother of the Greek hero Achilles. ​Thetis was a Nereid, one of the 50 daughters of Nereus, the Greek sea god connected with the Aegean Sea, and Doris, the Oceanid daughter of Oceanus and Tethys. Nereus was an early deity, being a son of Gaia and Pontus, but his role as sea-god was somewhat marginalised by the rise of the Olympian gods, with Poseidon, becoming the primary sea god of the Mediterranean. As a result, the role of the Nereids would become one primarily of members of Poseidon’s retinue, and indeed one Nereid, Amphitrite would become wife of Poseidon. Alongside Amphitrite, Thetis was the most prominent of the Nereids, and is best remembered today as a reoccurring figure in Homer’s Iliad, but Thetis does appear in many tales away from events linked to the Trojan War. ​It was said that Thetis, along with the Oceanid Eurynome, came to the rescue of the newly born Hephaestus, when the son of Hera was thrown from Mount Olympus by his mother, because of his ugliness. Falling into the sea, Thetis would transport the metalworking god to the nearby island of Lemnos, where subsequently the god established a forge for himself. On Lemnos Hephaestus would craft many useful, and beautiful, things, and Thetis was the recipient of some of the most beautiful objects crafted by Hephaestus. ​Thetis would also come the aide of Dionysus, for the Greek god of the vine had been driven out of Thrace by King Lycurgus; Dionysus fleeing because he feared that Zeus had sided with Lycurgus. Dionysus would find sanctuary in Thetis’ underwater grotto, and there, Thetis consoled the god, and reassured him that it was not his father who had sided with Lycurgus, but Hera had helped the king against her husband’s illegitimate son. ​Thetis proved of help to Zeus as well, for the Nereid discovered a plot against the supreme god, a plot concerning Hera, Poseidon and Athena. Before the plot could come to fruition though, Thetis enlisted the help of the Hecatonchire Briareus, who ascended from his palace beneath the Aegean Sea, to stand along the throne of Zeus. The presence of the gigantic Hecatonchire was sufficient to ensure that the Olympian gods forgot any notion of revolt. ​Thetis proved to be one of the most helpful of all nymphs, for the Nereid also aided the goddess Hera. During the adventures of Jason and the Argonauts, Hera was ensuring success for the son of Aeson, so when the Argo was prevented from going forwards because of the Clashing Rocks, Hera called upon Thetis to guide them through. Thetis was said to have told Peleus of how to traverse the Clashing Rocks, some say Peleus was chosen amongst the Argonauts for Peleus was wed to Thetis (more on this later), although the marriage of Thetis and Peleus was said by most to have come after the Quest for the Golden Fleece. ​Thetis was classed as being amongst the most beautiful of Nereid nymphs, and all Nereids were said to be beautiful. This beauty attracted the attention of many gods, and Poseidon and Zeus both tried to seduce the Nereid. The Greek goddess of Justice, Themis, then uttered a prophecy that stated that the son of Thetis would become greater than his father. This prophecy quickly put the brakes on the pursuit of Thetis by Poseidon and Zeus, for neither powerful god, wanted a son more powerful than themselves. Zeus decided that there was but one option, for Thetis would have to marry a mortal, for even if that son proved more powerful than his father, then that son would be no threat to Zeus. Peleus, a grandson of Zeus by Aeacus, was chosen as the mortal that Thetis would marry; Peleus was a noted hero of the age, being an Argonaut and a member of the Calydonian Hunt. 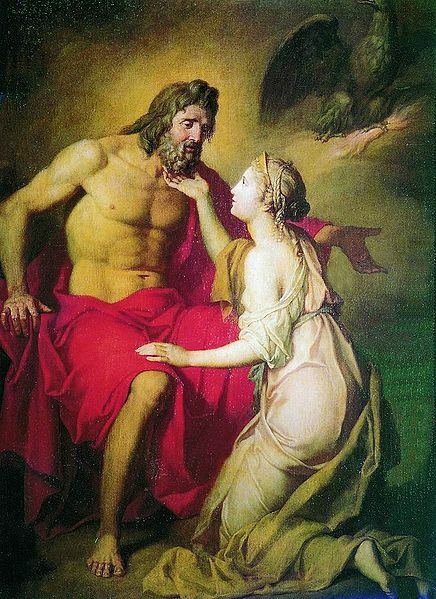 Peleus was more than happy with the proposed match, but Thetis was not consulted by Zeus, and the Nereid had no wish to be married to a mortal, no matter what his heroic reputation was. Thus, Peleus found his advances spurned by the Nereid. Peleus would need to some assistance if he was to make Thetis his wife, and this assistance was commonly said to have come from the centaur Chiron, a centaur who had already assisted Peleus when the hero had been abandoned upon Mount Pelion. Chiron’s word of advice saw Peleus lie in wait at the entrance to the Thermaean Gulf, and when Thetis passed by, Peleus caught hold of her and tied her up. The ropes which held Thetis were bound so tight, that even when Thetis changed shape, as the Nereid had the ability to do, she could not escape her bindings. Discovering that there was to be no escape, Thetis consented, agreeing to marry Peleus. 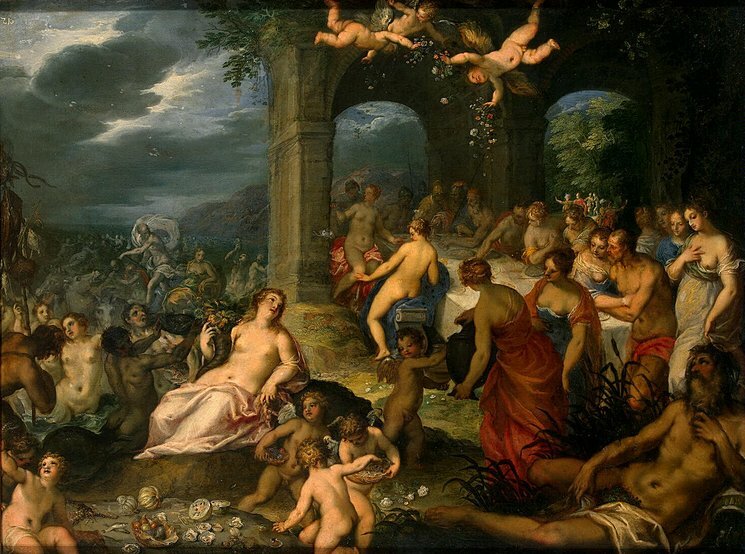 ​The marriage of Thetis and Peleus was one of the great events of the age, and upon Mount Pelion, a magnificent wedding banquet was arranged. Gifts were given, and Peleus would receive an ashen spear from Chiron, and immortal horses from Poseidon, but as festivities went on, the spurned Eris arrived, and amongst the gathered guests threw a Golden Apple, on which were inscribed the words “for the fairest”, words which would cause discord amongst the goddesses, but had no immediate impact upon Thetis and Peleus. ​Now the prophecy had stated that the son of Thetis would become more powerful than its father, and Thetis did give birth to a son of Peleus, a son that would be named Achilles. The son of Thetis was a mortal though, like his father, and Thetis sought ways of making him immortal. 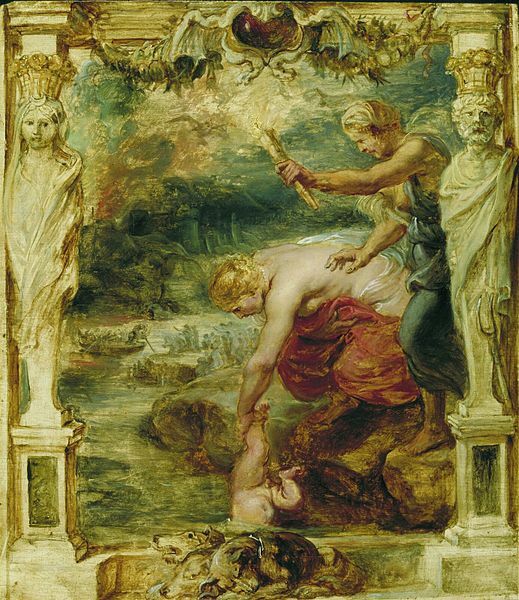 The original stories of Thetis in Greek mythology told of the Nereid anointing Achilles in ambrosia, before placing her son in a fire to burn away the mortal elements of his body. The idea might have been a sound one, but Thetis had neglected to tell her husband what she was trying to achieve. Thus, Peleus interrupted Thetis, and seeing his wife apparently trying to kill his son, Peleus shouted out in anger. Thetis would drop Achilles, and fled from their home, returning to the Aegean Sea. ​Today, there is a more famous tale of Thetis’ attempt to make Achilles immortal, for instead of fire, Thetis was said to have dipped Achilles in the River Styx, but Thetis held her son by the heel, leaving a bit of his body that was still vulnerable. This story only emerged in the Roman period, centuries after the original Greek myths. ​Peleus would subsequently place the young Achilles in the care of the centaur Chiron, who tutored the young boy; but Thetis had not totally abandoned her son. When, a number of years later, it became inevitable that the Trojan War was to commence, Thetis returned to her son. A prophecy had been told about Achilles, for it was now said that the son of Thetis was destined to live either a long and dull life, or a short and glorious one. Now, Thetis wished for the former for her son, and so to prevent him going to war, Thetis hid Achilles amongst the daughters of King Lycomedes of Scyros, disguised as another young woman. Thetis’ plans though was thwarted when Odysseus came to the court of Lycomedes, for Achilles chose arms and armour over female trinkets, revealing himself for who he was. ​With Achilles at Troy, Thetis tried to do all she could to protect her son, ensuring that Achilles had the best armour to protect him; this armour being made by Hephaestus, the metalworking god that Thetis helped earlier in his life. Thetis also arranges for Zeus to punish Agamemnon and the Achaeans, when Achilles and Agamemnon fall out over Briseis, and in this time the Trojans gain the upper hand during the war. Thetis does her best to guide Achilles, warning him that he is destined to die soon after the deaths of the Trojan defenders Hector and Memnon, but Thetis’ advice goes unheeded for Achilles himself kills both. Thus, Thetis watches as her son die at the gates of Troy, shot down by an arrow of Paris, guided to its mark by Apollo. ​Thus, just as the prophecies had stated, the son of Thetis had been greater than his father, and also had but a short and glorious life. Thetis, along with the other Nereids and Muses, mourn the passing of her son, some tell of Achilles’ ashes being mixed with that of Patroclus, but others tell of Thetis snatching up the body of Achilles, and transporting him to the White Island where he would spend eternity. ​Thetis would then watch as her grandson, the son of Achilles, Neoptolemus came to Troy to fight. Neoptolemus would take over from where his father had left off, killing many Trojan defenders. Neoptolemus was destined to survive the war, but as the Achaean leaders departed from Troy, Thetis came to Neoptolemus and told her grandson to delay his departure for two days, and make additional sacrifices to the gods. Neoptolemus took Thetis’ advice, and so was spared the trials and tribulations endured by many Achaean leaders on their return journeys. Peleus, the husband who Thetis had left behind would outlive both Achilles and Neoptolemus, and his last days Peleus saved Andromache, the concubine of Neoptolemus, from Menelaus’ deadly intentions, but whilst he was doing this, Neoptolemus was killed by Orestes at Delphi. At this point, Thetis returned to her husband, and informed him that he was to bury his grandson, and then return to the point where he had first trapped Thetis. It had been decreed that Peleus was to be made immortal, and so Thetis and Peleus were to be eternally together.